The extraordinarily favourable terms for this offer were: deposit up to £200 to receive a 50% bonus, as many times as you could manage over this three hour period; then complete the wagering requirements within the following 12-hour period. In all honesty, if this offer really goes ahead in its current form I will fall off my chair - it's pure insanity. 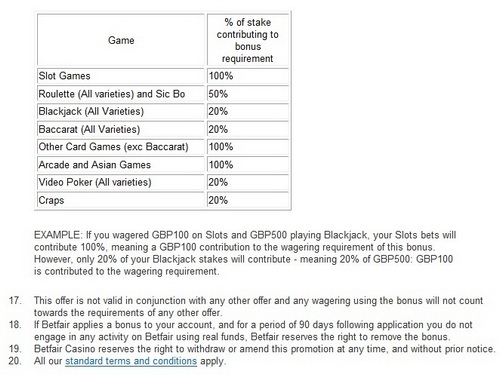 Ignoring the obvious bonus abuse possibilities, unlimited £100 10 x wagering bonuses playable on casino hold'em? Stackable with 12 hours to play them through? Someone in marketing is going to get fired big time on Monday if this goes ahead on Saturday. Indeed; I have never, in nine years of online gambling experience, seen an unlimited bonus offer. We recently ran a Casino promotion called Casino Happy Hour in which you participated. The promotion was live during the weekend of 13 and 14 November 2010. During and after the promotion, we suspended certain customers’ Casino accounts after it was alerted to some irregular and unusual gaming and depositing activity. Your account was one of those suspended. 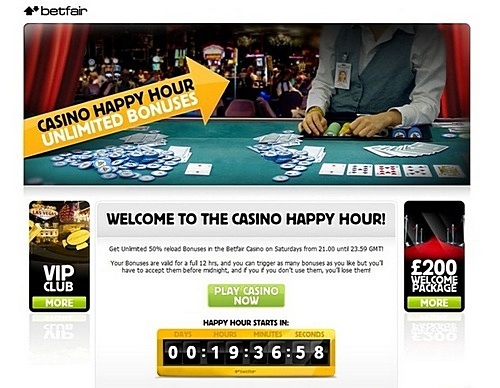 Certain customers attempted to profit from the promotion through adopting gaming patterns and activity in contravention of Betfair Casino’s Standard Terms and Conditions. As a result, we have withheld both bonus funds and winnings derived from such activity on those customers’ accounts, of which yours is one. We have taken steps to make sure all of your actual deposits have remained in your account, and your account will be reopened within 48 hours. You are of course then free to continue to use your deposited funds to play in the casino, or to withdraw them at any time. We appreciate this has been an inconvenience to you, but are happy to have the situation resolved and to make your deposited funds available to you again. On the weekend of the 13/14th November Betfair ran a promotion for its casino product. It subsequently came to our attention that certain customers exploited the spirit of this promotion. The accounts of all customers that took part have been reviewed by Betfair, and corrective action has been taken where appropriate for those who acted in contravention of our terms and conditions. Betfair has corresponded directly with all customers who were affected by this. If any customer would like to discuss the matter further, they may contact the LGA in Malta by e-mailing complaints@lga.org.mt or telephoning +356 21316590. Whatever the actual circumstances of this the biggest promotional blunder in the history of online gambling, talk about the "spirit of the bonus" is nonsense. The players who followed the rules did nothing wrong. 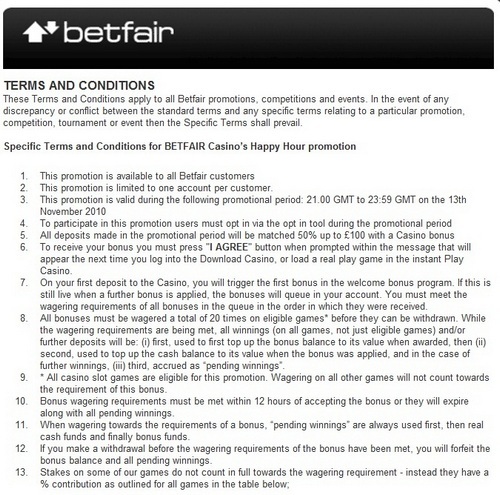 Betfair then proceeded to change the rules of the promotion after the event. The main changes are a doubling of the wagering to twenty times rather than ten, and removal of all games other than slots. Twenty times wagering on slots basically eats up the entire bonus, leaving no profit value. I withdrawn 32000€ saturday night after the promo. I received them on Tuesday in my bank account, no e-wallet, no paypal stuff, just my bank account where are all my life savings. Guess what, on thursday, 18 November betfair debited 32000€ from my bank account. Betfair's response to the matter has been unprofessional and chaotic, and shows no sign of changing. 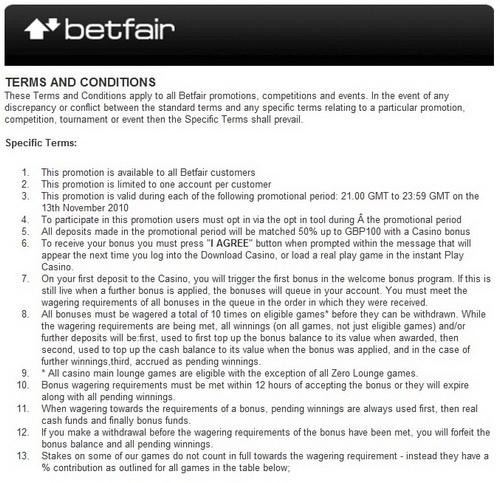 The original terms of the offer were Betfair's standard promotion terms: ten times bonus wagering, with some games requiring more wagering than others. Although the wagering is heavier for low house edge games like blackjack and video poker, this still yields substantial positive value for the player. This promotional template was used for the happy hour deal. Why, if Betfair was happily and profitably running promotions up until now with these terms, did everything go monumentally wrong this time? The answer lies in the player demograph which the "unlimited" nature of this bonus yields. 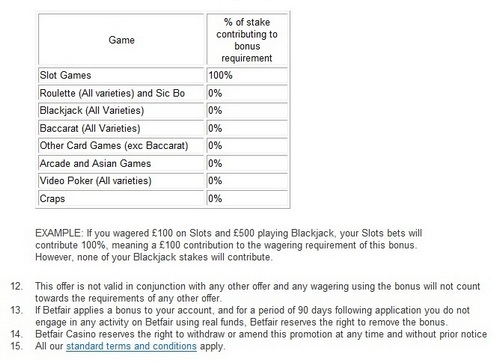 When Betfair offers a "deposit £50, receive £50 free" bonus, advantage players will take part and make a profit, but so will recreational gamblers. The recreational players will play free and loose, they'll lose both deposit and bonus in the process and Betfair will sign off a profit because the recreational crowd far outnumbers the advantage players. However, the balance changes radically when you increase the stakes. Offers of huge bonuses for huge deposits will still be taken up by the recreational gamblers, but these customers will deposit their usual £50, £100, £200 or however much, not the thousands or tens of thousands potentially on offer; their losses will be correspondingly small. The advantage players, on the other hand, will deposit as much as possible, be it thousands, tens of thousands or conceivably hundreds of thousands, and will achieve correspondingly large winnings. In this way, the normal balance of profitable recreational gambler to advantage player is blown apart. This is similar in essence to the imbalance created by advantage players who operate multiple accounts. Betfair's mistake was not taking this demographic change into account when offering their usual relatively loose terms on an unlimited bonus amount. On the other side of the equation, the bonus players bear some responsibility. Sensible deposit levels would have probably still led to a trouble-free outcome, and all players would have ended up getting paid - including advantage players - as has always been the case. The sheer scale of the advantage player deposits is what caused the enormous imbalance and the resulting carnage. Still, it's down to casinos to write their promotions in such a way as to avoid these outcomes, notwithstanding the ill-advised behaviour of many customers. How this will end up is as yet unclear. Betfair's response to date has been unconvincing and unprofessional, but appears set in stone. Bert Black's p2p idea is a monster of a product, sold out & floated, and has now become a bloated monster with retroactive taxes on winners, allied with the bonus abuse nonsense. Bert's idea never involved cartoon greyhounds, virtual baccarat and an amusement arcade, all run cutthroat to appease shareholder x, y + z..